Hi Guys! 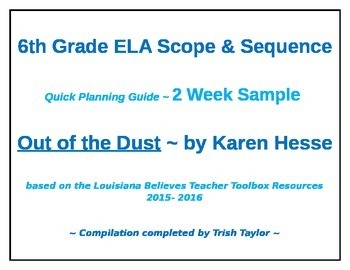 You've found a Sample 2 Week Quick Planning Guide for the Louisiana Believes Out of the Dust (Karen Hesse) 6th grade Unit. 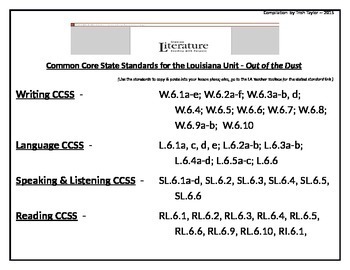 It includes links for the Anchor Text, the Louisiana Unit Plan, Shmoop summaries, and PARCC practice questions.This 2 week pacing guide includes suggestions like the aligned Common Core Standards, weekly Academic Word focus, weekly PARCC questions focus, etc. 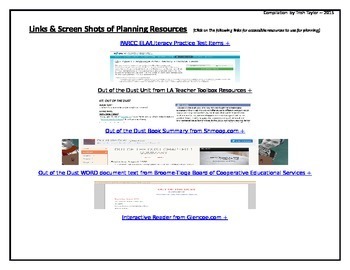 I've also added McDougal Littell and Interactive Reader/ Writer tie- in suggestions. 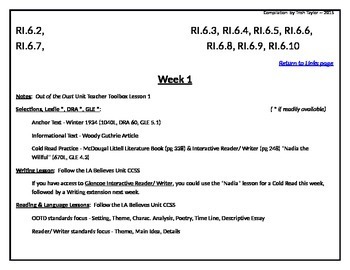 It's a quick one page per week glance. I hope you like it!